In the previous issue, I mentioned that Professor Yamane pointed out 3 factors that contributed to the birth of Ikebana in the Muromachi period: the Aristocrat factor, the Shinto and Buddhism factor, and the Samurai factor. However, I cannot agree with his theory. I would like to focus on the contrast between Jomon culture and Yayoi culture. Jomon is the Japanese native culture related to Shinto. The Yamato clan gained power during the Yayoi period and established the Japanese nation in the 5th to 8th century with strong influences from China and other foreign cultures. Towards the end of Heian period (794-1192) the Samurai class gained power. Considering that they had a strong base in Kanto and Tohoku, far away from Kyoto, their culture was probably deeply rooted in the Jomon culture. I think the establishment of the Kamakura shogunate (1192) brought about a revival of the Jomon/Shinto culture. New Buddhism movements in that era, including Zen, are actually a Shintonization of Chinese Buddhism. Based on my hypothesis, we could reinterpret Professor Yamane’s theory. We could suggest a contrast between the Yayoi/Aristocrat/Buddhism factor and the Jomon/Samurai/Shinto factor. Then, we could assume that Tatehana, the main stream Ikebana in the Muromachi period belongs to the former, while the new ikebana belongs to the latter. 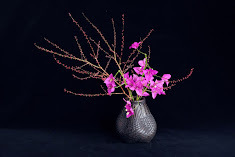 The new style of Ikebana, ikebana, was in opposition to Tatehana reflecting the strong cultural differences. New art does not develop naturally but can be understood as an opposition to the existing art. Now we can finally answer to the question: does ikebana mean to make dead flower alive or to make flower live longer? I will give an answer next month. This is the work I made for the Lesley Kehoe Galleries during Mr Tomokazu Matsuyama’s exhibition in October 2014. Thanks to these large bamboo containers, my clients happily accepted my design proposal and they loved my work.